This photo album contains more than 125 full colour images showing scenes of life in rural Karen State, from paddy cultivation to attacks on villages to flight as displaced people and refugees. 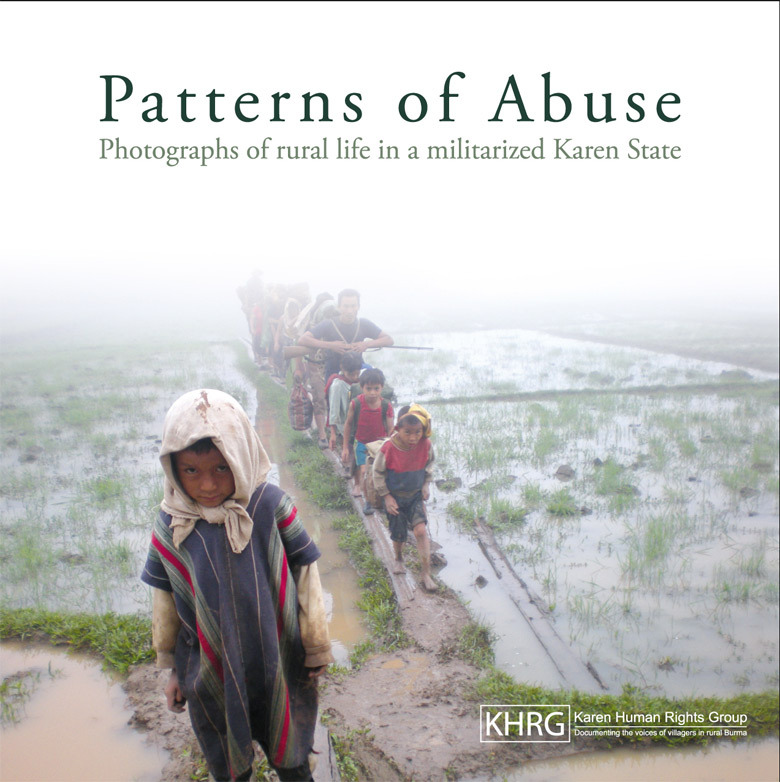 Photographed over the course of KHRG's nearly 18 years of human rights work, these images present a striking picture of the patterns of abuse experienced by villagers in a militarized Karen State. Professionally printed on glossy paper and in a hard cover binding, this photo album is available for sale on the KHRG website. All proceeds go to funding KHRG's documentation work, gathering information, stories and photos from villagers and advocating for respect of human rights in Burma, as well as supporting villagers' own strategies to claim their rights. In July of 2009, KHRG released its 400th report. While something of a milestone, such an event for a human rights organisation is more deserving of reflection than celebration. The fact that KHRG continues to release human rights reports on a regular basis indicates that, despite changes in the local-level political and military situation in Karen State, patterns of abuse observed in the early 1990s continue in the areas where we work today. As 2010 begins, KHRG is releasing this album of photographs to look back at some of the more striking images which KHRG researchers have captured over the nearly 18 years that the organisation has been operating. Hopefully these photographs will prompt some reflection on the part of KHRG readers and staff alike; reflection on the persistent, yet dynamic, situation of abuse in rural Burma, its impact on the lives of millions of villagers across the country, and the dignity with which these individuals have sought to assert control over their lives despite their disadvantaged position and the repression they face. The 98-page album is made up of more than 125 full colour images, professionally printed on glossy paper and in a hard cover binding. After an introduction, which provides a thorough background on the historical and political context underpinning the human rights situation in Karen areas, the album is divided into sections dealing with different areas and issues in Karen State. The photographs in each section are accompanied by commentary that explains the circumstances in which the photo was taken and, where applicable, places it in a broader cultural, political or historical context. Clear visual patterns stand out in each section, and these serve to highlight the issues, obstacles and responses most relevant to villagers in the areas where KHRG works. In the first section, for instance, a chapter devoted to village life primarily contains photographs of activities related to the agricultural cycle, from the initial planting and transplanting periods to reaping, threshing and post-harvest celebrations. The second section, set in areas under government control, is made up primarily by photographs of villagers working to meet exploitative demands placed upon them by the Burma Army and other armed groups. In the third, villagers in areas where government control is not yet fully consolidated are primarily shown on the move - both because the Burma Army deliberately seeks to displace them and because flight is an effective form of resistance. The photographs collected in Patterns of Abuse span over 17 years from KHRG's founding in 1992 until mid-2009. The most recent photos were taken on higher quality digital cameras and are of noticeably better picture quality than those captured earlier. We have therefore favoured those more recent photos in our selections for the album. Though KHRG often modifies photos to obscure and protect villagers' identities, for this book we have chosen those photos which do not require censorship, either where individually implicated villagers are not visually identifiable or else are not living in areas under SPDC control. For all other human rights reporting, KHRG has refrained from editing photos for aesthetic reasons, choosing instead to publish photos as captured by field researchers. In this album, however, photos have been edited to maintain visual continuity wherever possible. KHRG has always made full copies of reports freely available as downloads and provided hard copies on request. This report, however, is being offered as a fundraiser that will help KHRG to continue its documentation work, gathering information, stories and photos from villagers and advocating for respect of human rights in Burma, as well as supporting villagers' own strategies to claim their rights. Purchases can be made on our website. A few example pages can be seen below as well as downloaded from this page, while other pictures of rural life in Karen areas can be found online in our photosets, as well as individual reports and bulletins.